Clarksville, TN – Some of Austin Peay State University’s spring sports and athletes have gotten some early praise and recognition for their respective upcoming seasons, as several more teams are just days away from starting their seasons. Off to a quick 3-0 start this spring, the APSU women’s tennis team was picked as co-favorite to win the Ohio Valley Conference regular-season title, as they picked up six of nine first-place votes in the conference’s pre-season poll – while the other co-favorite Murray State picked up the other three first place votes. 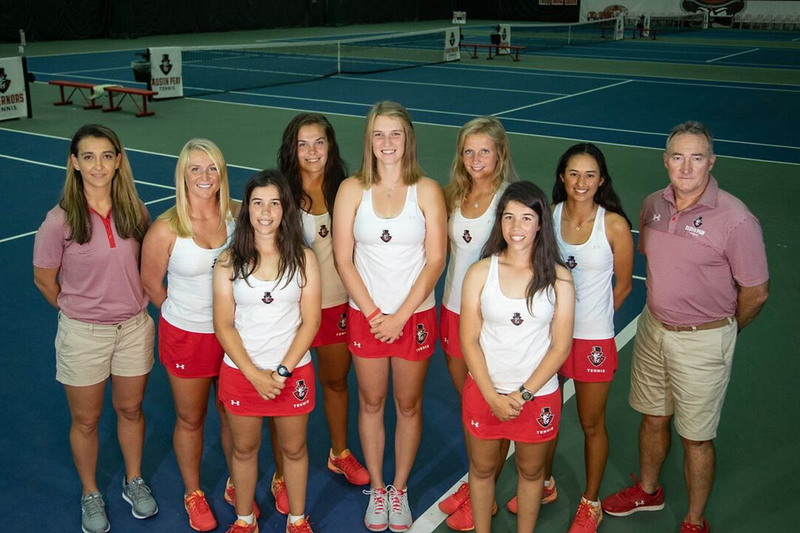 Three of the women’s tennis team’s players were also selected as pre-season conference Top 10 selections with three-time defending OVC Player of the Year Lidia Yanes Garcia at No. 1 followed by teammates Fabienne Schmidt – last season’s OVC Freshman of the Year – at No. 3 and Tatiana Lopez at No. 4. The men’s tennis team was selected to finish fourth in their pre-season poll, with senior Almantas Ozelis being selected as one of the conference’s Top 10 players coming into the season, placing at No. 7. The women’s indoor track and field team has also gotten off to a good start, led by pole vaulter Savannah Amato, who has earned OVC Female Athlete of the Week three times this season so far, while sprinter Sabrina Richman has won Female Track Athlete of the Week twice. Amato and fellow pole vaulter Dascha Hix have also posted vaults ranked in the Top 50 nationwide this season. With their season less than two weeks away, the Governors softball team was picked a program-high third in the OVC’s preseason poll earning 204 points and three first-place votes to trail defending OVC regular-season champion Eastern Kentucky (230 points/10 1st-place votes) and last years tournament champs Jacksonville State (226 points/11 1st place votes). The softball team finished second in the conference’s standing last year with a 35-19 overall mark and a 17-4 league record and return 18 letter winners from that squad, including 2018 Pitcher of the Year, Morgan Rackel, OVC Freshman of the Year, Bailey Shorter, OVC First-Team selection Danielle Liermann, Second-Team pick Kacy Acree and All-Newcomer Team members Kelly Mardonez and Natalie Schilling. Finally, Governors baseball player Parker Phillips was selected as one of four OVC athletes to be named to one of Collegiate Baseball’s Preseason All-American Team’s, earning a First-Team selection as an outfielder. Phillips blasted 19 home runs as a junior, tying the Austin Peay single-season record set by Nate Manning in 1996 and enters the season with 31 career homers, seven away from breaking the APSU career record held by Lance Wampler (37 HR, 1997-2000). He was also ranked nationally last season in slugging percentage, runs batted in and hit by pitches.